Lately, reviewing the queues, I'm seeing a lot of answers encouraging the OPs to simply restart the service that isn't working or even their computer/server to see if that solves the issue. It's quite clear that these are not good answers, so I usually flag them as Not an answer or Very low quality. The problem comes when some of these answers are upvoted (some of them even with more than one positive vote), or even accepted (usually the OP replying themselves arguing that they finally managed to solve it by restarting the mentioned service/server/whatever). Should these answers be flagged, it doesn't matter how many upvotes they have? In the case where the own question author replies themselves with the restarting worked for me, should we vote to close the question as well? Good question. However, I'm going to play devil's advocate and explain why I think answers like this are fine. Let's generalize the concept to "simple but effective remedies". This is a category of answer that's extremely easy, well-known, and solves a broad variety of problems, either temporarily or permanently. 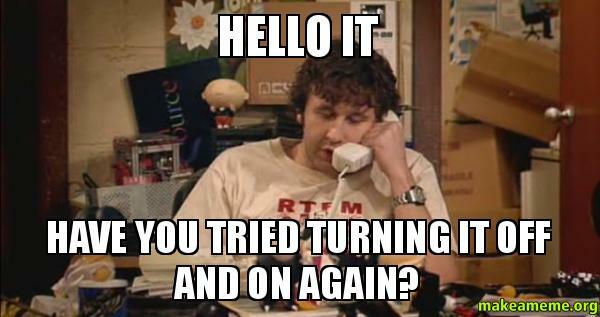 The clueless user trying to milk easy rep by spamming every question with "Try rebooting, that might fix it". The well-reasoned researcher, who googles around (or has personally hit the same problem) and finds that a reboot or other simple common remedy is the most likely fix. They also provide a link to any evidence they have to third parties that have said that this remedy is effective. In the case of answerer #2, I'm fine with them posting such an answer, and we shouldn't delete it. In the case of answerer #1, hopefully they get enough low quality flags that the answerer gets suspended or answer-banned after some time. I feel that the quality control systems already in place provide sufficient filtering of bad answers that simply prompt the querant to reboot without providing any details (especially for questions where doing this is not actually effective). I also think there are also probably sufficient systems in place to prevent good answers (with reasoning, links, etc.) that prompt the user to do this with good reason from being deleted. Therefore I don't think any changes are needed to account for this type of answer. We're already doing what should be done in most cases. If you find a specific instance where this was handled badly, e.g. a bad answer saying "Try rebooting, see if that helps" in response to a "How do I format my cells in Excel?" question, flag it. If you find an answer where it's downvoted or deleted and the "Just reboot and it'll fix it" answer is actually correct, flag it to be undeleted and/or upvote it. I can't imagine a situation where an answer suggesting to reboot might be useful to a reasonable user. In fact, the first thing reasonable people do before asking is making sure the issue is reproducible, and that should include rebooting. Unfortunately, some people rush to ask, so this catchphrase never gets old. I'd say if the answer suggests to reboot (and nothing more) it should be deleted or converted to a comment, even if the answer has helped the OP. Actually, if the OP accepts such an answer, it's a strong indication that the question itself should be closed as "Not reproducible". Of course, this does not apply to answers which suggest a reboot as one of the steps, to make sure the OP doesn't miss it and does reboot at the right moment. What about the possibility that the computer is behaving erratically, and a restart is the only way to clear the memory of the all the various 'data junk' that accumulates over time? From a software perspective, an operating system and the programs you run on it tend to accumulate all sorts of cruft over extended periods of use – temporary files, disk caches, page files, open file descriptors, pipes, sockets, zombie processes, memory leaks, etc. etc. etc. All that stuff can slow down the computer, but it all goes away when you shut down or restart the system. So shutting down your computer every once in a while – and I do mean actually shutting down, not just hibernating or putting it to sleep – can give it a “fresh start” of sorts and make it seem nice and zippy again. However, different computers and OS’s are not all equally affected by this phenomenon. Generally, a computer with a lot of RAM can go for much longer than a computer with only a little RAM. A server, on which you just start up a few programs and then let them work, will be fine for much longer than a desktop computer, where you’re constantly opening and closing different programs and doing different things with them. Plus, server operating systems are optimized for long-term use. It’s also been said that Linux and Mac OS tend to run for longer than Windows systems, although in my experience that mostly depends on what programs you use on them, and not so much on any differences between the kernels of the operating systems themselves.